Cancer is known as one of the deadliest diseases in the world. In the Philippines, cancer now ranks as the third leading cause of death among children. It is estimated that there are 10 Filipino children who get diagnosed with cancer everyday. Furthermore, it is no secret that diagnostic tests and the treatments themselves are expensive even for the average Filipino family. 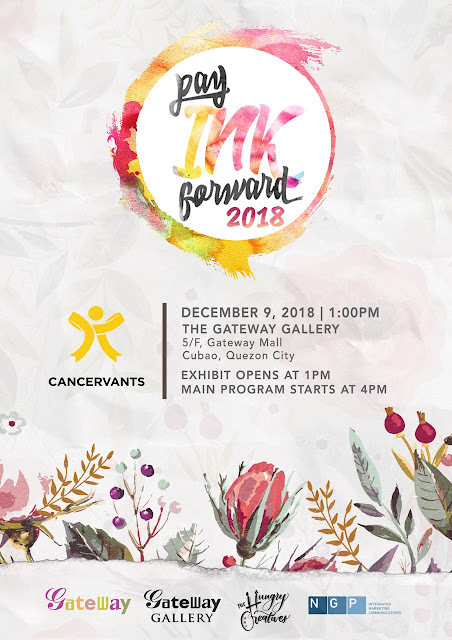 In response to this prevailing problem, Cancervants PH committed to help raise pediatric cancer awareness by thematically incorporating the Gold Ribbon to different projects and subsidizing in the medical treatment of children with cancer. One of these projects is Pay Ink Forward (PIF), an artwork auction that showcases not only the gold ribbon but also the creative prowess of Filipino artists. This yearly auction gives opportunity to local artists to give back and for Filipinos to help children with cancer in ways that will not crack their pockets. Proceeds will go to the payment of hospital bills, laboratory test fees, cancer drugs and more. This year marks the fourth time that Cancervants PH will be holding of Pay Ink Forward.